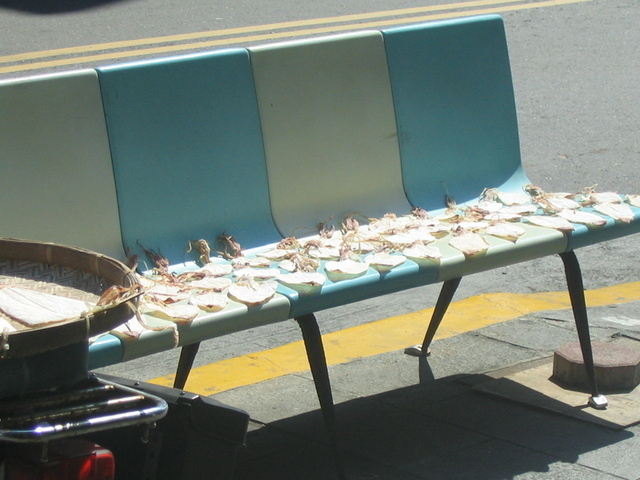 Squid drying on a public bench in Penghu, reknowned for its excellent seafood, both dried and fresh. Maybe a little too fresh. Just down the street from here, we had an delicious dinner. There are a number of restaurants by the harbor with tanks full of fresh fish and shrimp and mollusks. We picked out a fish, and they thumped it with a wooden mallet on the sidewalk before cooking it up fresh.